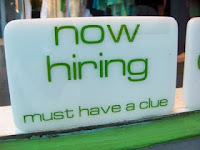 Bob Johnson's Rants and Raves: People Listen - IMPORTANT JOB INTERVIEW TIPS! 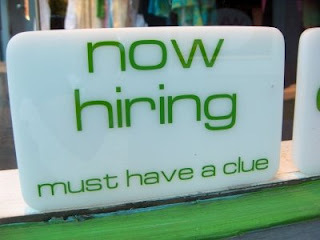 If you are currently hunting for a job and you only read one post from my blog you should read this post. Make sure your clothing is color matched including your socks! Remove the price tags from your clothing. Groom yourself, i.e. mow those eyebrows, trim the nose hair and take a shower! Sit up and pay attention to the interviewer. Don't 'lounge' or slouch in the chair. Highlight the strong points in your life. Do not write a book about it. Do not talk negatively about former employers and co-workers. No matter how much they sucked and made your life miserable. Use that obscure website Google to learn more about the company you will be interviewing with. Practice having a firm handshake. For those of you that are curious. I am in the process of hiring a PC Technician. I haven't had the opportunity to put out an ad for hire in over 3 years. So I guess I have been out of the loop for too long. In my delusional fantasy world, I thought that the unemployment rate was at an all time high and that people would be begging for jobs. I thought that I would be inundated with resumes and phone calls. I thought that I would have the position filled in less than a week. After all there should be a large base of well qualified applicants just waiting for an opportunity. Well folks, I thought wrong. In reality here is what is happening. I have received a total of 12 resumes in no more that a week of advertising the job on Craigslist and the state of Delaware's job site. Of the resumes I received I tried calling four (4) applicants for an interview. I have currently interviewed 2 people and a third interview scheduled. The fourth person has not gotten back with me. Here is a good example of how I feel. So here is my take on this situation. I think to say the number of people not working is an "unemployment rate" should be renamed to "Deadbeats that no one wants rate". Looking at the applicants I received it would seem that companies have been shedding the people that are not profitable and dare I say, lazy. Hey wait, we can call it the "Lazy Rate". Perhaps this is the result of the 'Entitlement Generation'. It is the so called 99% that Occupy and basically does not want to work, yet want the 1% to share the wealth. Is this just another symptom of the larger problem. I say yes. WAKE UP PEOPLE! Nothing is free in life and you have to WORK for everything you want to achieve. Simple yet so many things people just tend to miss, great post, totally agreed about the lazy bit. Some applicants didn't even show up for the interviews!